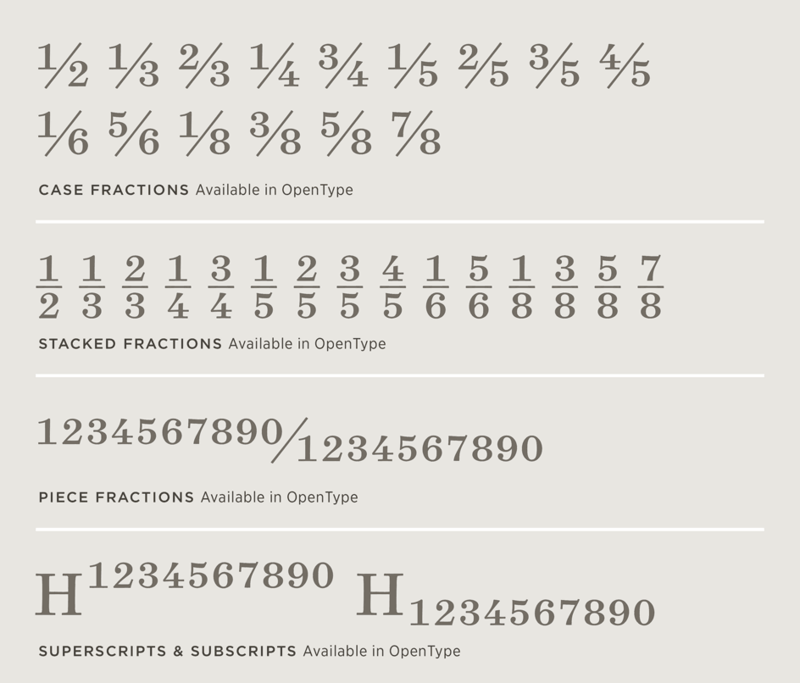 Surveyor Font Features: Numerics | Hoefler & Co.
Surveyor contains everything you need to tackle demanding content in small sizes, whether you’re using Surveyor Text in print, or Surveyor ScreenSmart on the web. Both Surveyor Text and Surveyor ScreenSmart feature a full set of tabular figures, built on a fixed width to ensure that columns of data align correctly. Tabular figures are included both Surveyor Text Pro and Surveyor ScreenSmart Pro, and in the Surveyor Complete package. 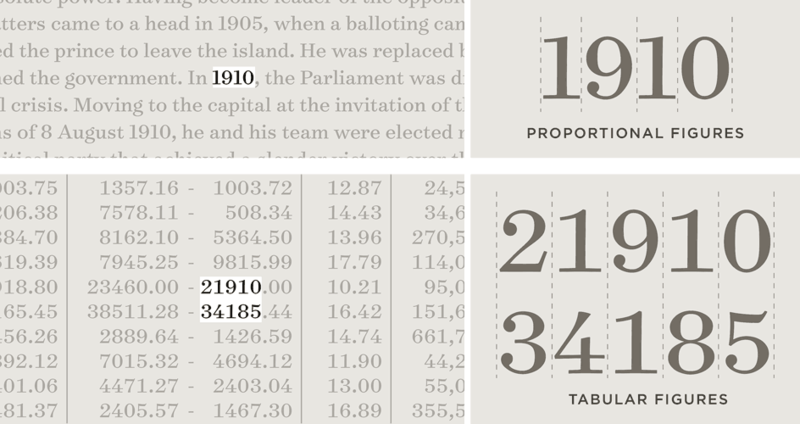 Surveyor’s tabular figures maintain the same character widths throughout the complete range of weights and styles, an essential feature for when boldface is used to highlight an entire line (as is common in stock listings and sports statistics.) In each of Surveyor’s styles, the fractions, monetary symbols, and mathematical operators are built on matching widths, so that a price expressed in dollars won’t affect the grid when the currency is recalculated in Euros. Styles that include tabular figures also feature “case fractions” in denominations of halves, thirds, fourths, fifths, sixths, and eighths. Each font includes a full set of numerators and denominators, all properly kerned to the fraction bar, for creating custom fractions with either a diagonal or vertical orientation. Also included are a full set of superscripts and subscripts, for footnotes and formulae. In addition to the standard monetary symbols included in all H&Co fonts (dollar, Euro, pounds sterling, yen, guilders, and cents), OpenType versions of Surveyor fonts include an additional eight symbols for the Baht, Colon, Naira, Peso, Rupee, Rupiah, Won, and Sheqel.